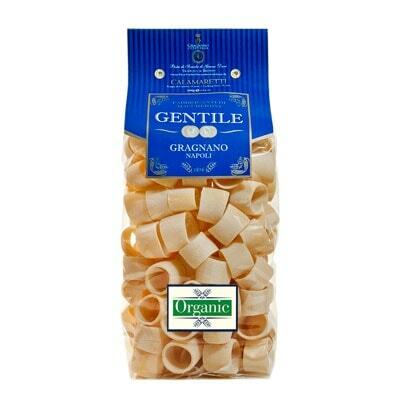 From the Campanian pasta maker Gentile, this pack of Calamaretti is beautifully from of 100% Italian wheat. Not only that, all its ingredients are organic. A type of pasta that looks like sliced calamari pieces, otherwise known as Calamarata, it’s usually short but large tubular pasta cuts. It is perfect for catching the sauces in the hollows of each pasta piece. Although most typically serve it with seafood sauces, you can also prepare it with creamy white sauces or tomato and meat sauces. As a matter of fact, it would be great with ragu sauce, which is typical of the Emilia-Romagna region. Haven’t tried this pasta shape? Grab a bag now!